The comics industry is still trying to figure out how to adapt to the digital landscape, and while there have been considerable strides in the last few years, there remains much to explore regarding the creation and distribution of comic books in the digital age. Launched in late January, the new digital comics company Stela is leading the expedition into this uncharted territory, offering daily digital comics specifically formatted for vertical scrolling on a mobile device with a monthly subscription price of $4.99. Co-founders Sam Lu, Jason Juan, and Ryan Yount all come from the world of mobile gaming, and they’ve created a digital comics app that is breaking new ground for the future of the medium. While it’s not the only digital comics app on the market providing original content, it’s taking a different approach to the digital comics game by commissioning new works in a single specific format and making them all available via a monthly subscription rather than in-app purchases. There’s also a social aspect to Stela, and readers can like and comment on each creator, series, and individual chapter. Tapastic’s Tapas app offers a similar reading experience, but it’s not as streamlined as what Stela is doing, and the sleek functionality of the Stela app is a large part of its appeal. The other large part is the quality of the comics, especially in relation to the small price they’re being offered at. (First issues for all Stela series are also free to try for those who want to sample the goods before getting a subscription.) Featuring a creative line-up of industry veterans like Joe Casey, Stuart Moore, and Ronald Wimberly with exciting up-and-comers like Irene Koh, Jen Bartel, and Luke Parker, Stela has a strong artistic foundation built by senior editor Jim Gibbons, formerly of Dark Horse Comics. One of the coolest things about these comics is discovering how the talent involved uses the vertical scrolling format, and while many of creators stick to a more traditional panel progression, others are delivering bold experiments that take advantage of the seamless flow of this comic structure. Ronald Wimberly has done exceptional work with vertical scrolling comics in the past (his one-shot “Lighten Up” was one of The A.V. Club’s Best Comics of 2015), and he’s the creator doing the most exciting work at Stela with GratNin: KGMR, a thrilling story about three young Brooklyn ninjas—Roxy, Kibo, and Mo—who break the rules of their pacifist, anarchist clan to protect their neighborhood. Action and atmosphere are Wimberly’s two main priorities with this title, and he does phenomenal work using the Stela format to intensify both of these visual elements. The free first chapter of GratNin: KGMR is a riveting introduction to the series, beginning with an exhilarating brawl in Brooklyn’s Gowanus projects that showcases Wimberly’s talent for accentuating movement with exaggerated character physicality, dramatic angles, and high-contrast coloring. The story is “presented in BREAKOUT SCOPE,” and it really does feel like a new way of reading comics, particularly in the way Wimberly has panels bleed into each other. The smaller beats of the action are broken into more traditional panels and gutters, but when there’s a big moment, like Mo getting kicked in the face, Wimberly abandons those borders and has the action fill the whole page, composing the image so it is intensified by the movement of the vertical scroll. The first thing the viewer sees is the evocatively lettered “CRACK!” sound effect with a foot kicking through the center of the word and a burgundy stream of blood pointing downward, and as the reader scrolls, they follow the stream of blood to Mo, who is moving forward and down just like the comic. When Mo throws down a bomb full of hallucinogenic green gas, the gutters are gradually flooded by a thickening green cloud as her opponent chokes on the smoke, and that rush of color leads to the psychedelic shot of Mo coming in to land her devastating “Proust-Knuckle” finishing move. That attack segues smoothly into the title page, which seques smoothly into the text explaining the book’s general concept, which segues smoothly into a shot of the ninja’s opponent dangling from a streetlight, a visual given extreme height by making the viewer scroll further to get the complete image. While many of the images in GratNin fit completely on the screen, Wimberly often structures the panels so that they bleed into the unexplored space below, which keeps the action moving at a rapid pace while also allowing Wimberly to ease readers into an environment, like the aforementioned shot revealing the dangling Daryl Dekker. There’s an especially striking example of this in chapter two, which begins with a brutal prison fight before shifting gears to show the three young ninjas staking out the place they’re about to rob. The establishing shot of Roxy, Kibo, and Mo begins with the moon shining through dense leaves, with a repeated orange “ki-ki” sound effect leading downward to a cricket on the branch of the tree above the ninjas. A word balloon continues the downward motion to reveal Roxy, Kibo, and Mo, technically in the same shot with the moon and the cricket although the whole visual isn’t seen on the screen, and when a new panel is introduced revealing a different aspect of the environment, it’s connected to the previous image by a word balloon bridge. This introduction to the setting ends with a long shot revealing the entire building the ninja are about to break into, and that gradual scroll makes for an immersive entryway into this new location. The distance between the ninjas hiding behind the shed and their target building is an essential element of one of GratNin’s best moments thus far, a sequence in chapter three where Mo launches Roxy to the top floor. The severe perspective shifts in this panel progression give the action a sense of urgency, rapidly accelerating to the moment when Mo sends Roxy soaring two stories up. The perspective is significantly less dramatic once Roxy sticks the landing and delivers a thumbs-up to Mo, offering a peaceful moment of relief after visually building up the tension in the preceding images. This week’s chapter four is the calmest GratNin yet, incorporating more humor into the narrative as the characters catch their breath. That doesn’t make it any less engaging though, and these quieter moments ground the narrative after three chapters of heightened action. The title might be short for “Gratuitous Ninja,” but this week’s chapter shows that Wimberly isn’t solely concerned with gratuitous ninja spectacle and is willing to slow down to give the reader a better idea of the characters’ personalities and how they relate to one another. (See also: the dinner scene in chapter one.) This provides a point of contrast that amplifies the bigger moments, and Wimberly’s firm understanding of these storytelling dynamics makes for a very compelling read. Great editors make great comics, and it’s doubtful that GratNin would be as captivating without the guidance of David Brothers and Kibo Hayashi. There’s a lot of ambition on display in Wimberly’s work, but there’s also the potential for a messy final project if that ambition isn’t focused. 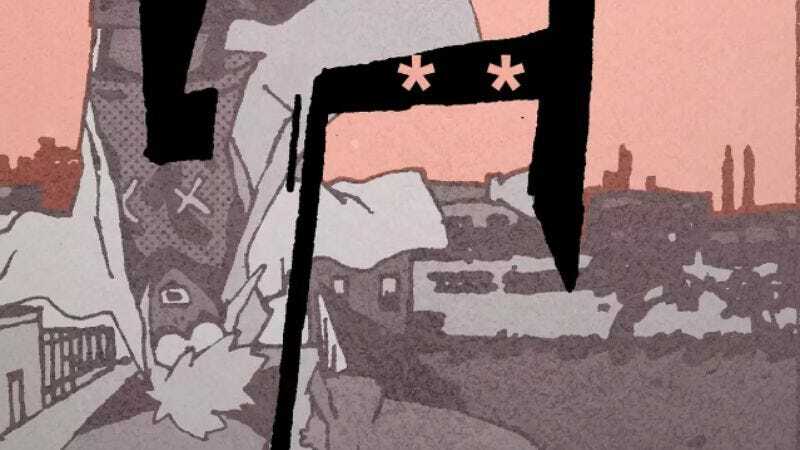 The editors of GratNin are keeping Wimberly on the right track, giving him freedom to explore the creative opportunities of this format without sacrificing the clarity of the story. The end result is a fascinating, breathtaking comic, setting a high bar for other Stela creators to meet.